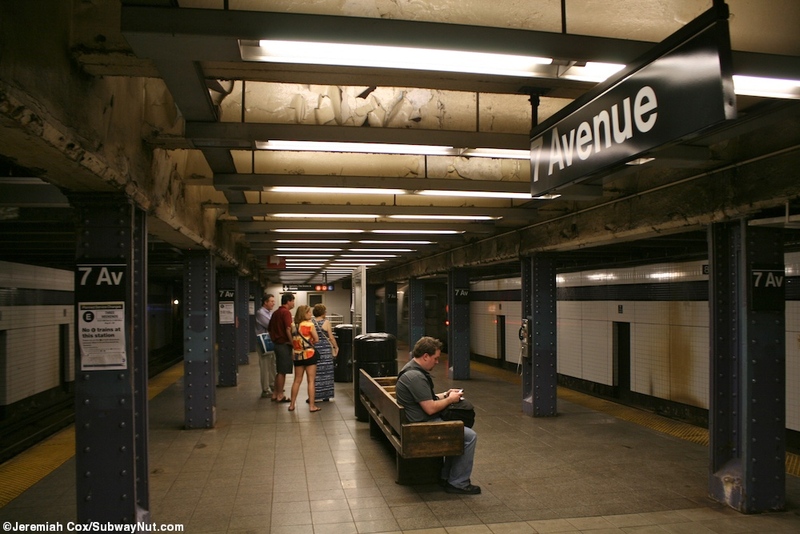 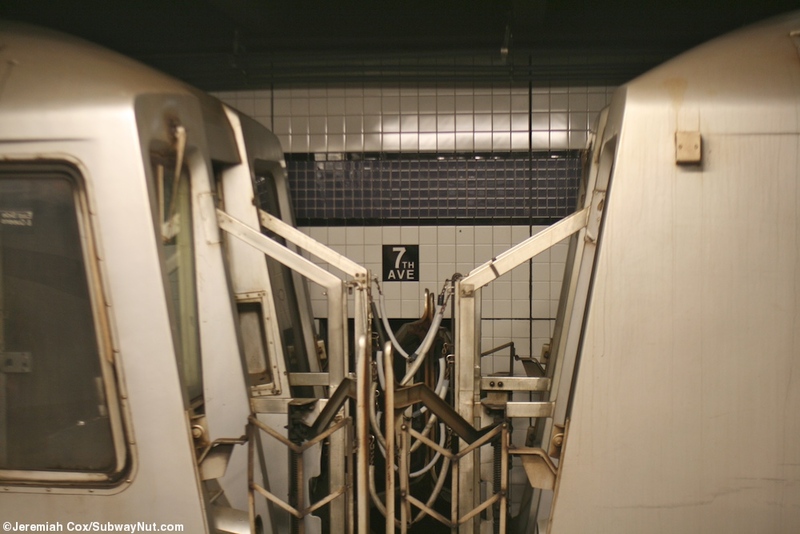 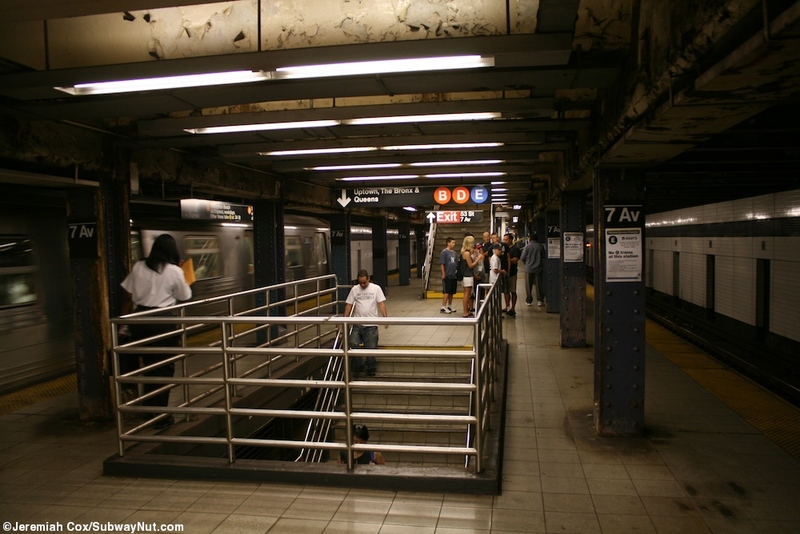 7 Avenue is one of the more unusual subway stations and the only stop where trains running on different lines running in different directions share the same island platform. 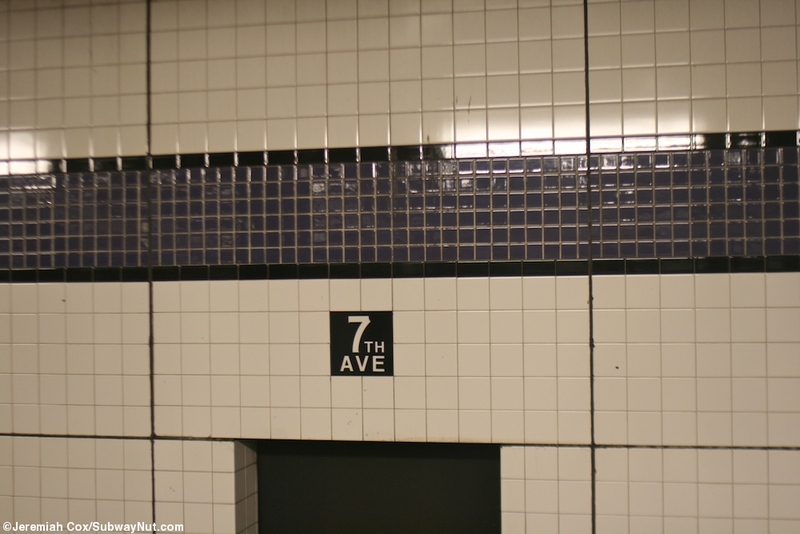 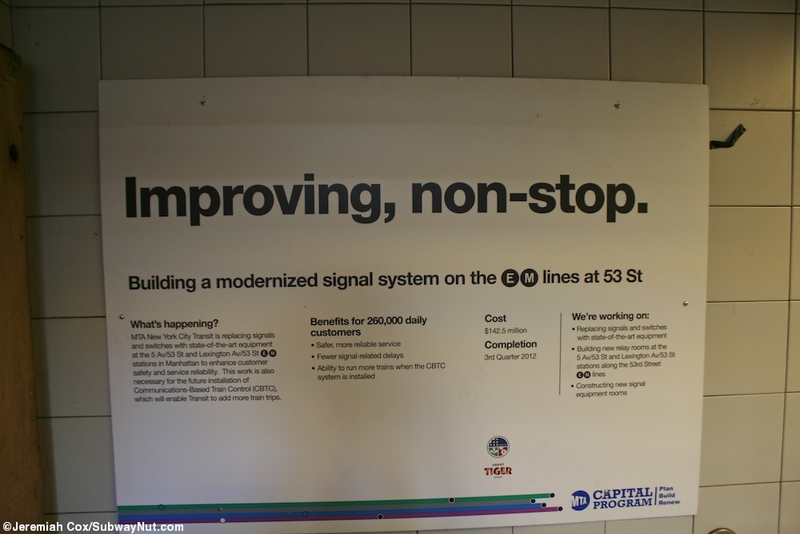 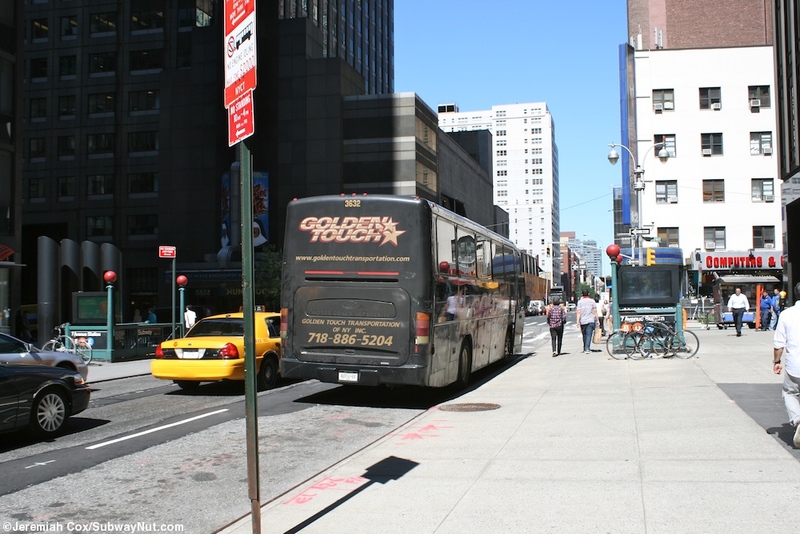 The stop has two of these, located three staircases below the surface since the station underpins both the IRT Broadway-7 Avenue Line running beneath Broadway and the BMT Broadway Line running beneath 7 Avenue (the lines switch and do not cross each other at Times Square). 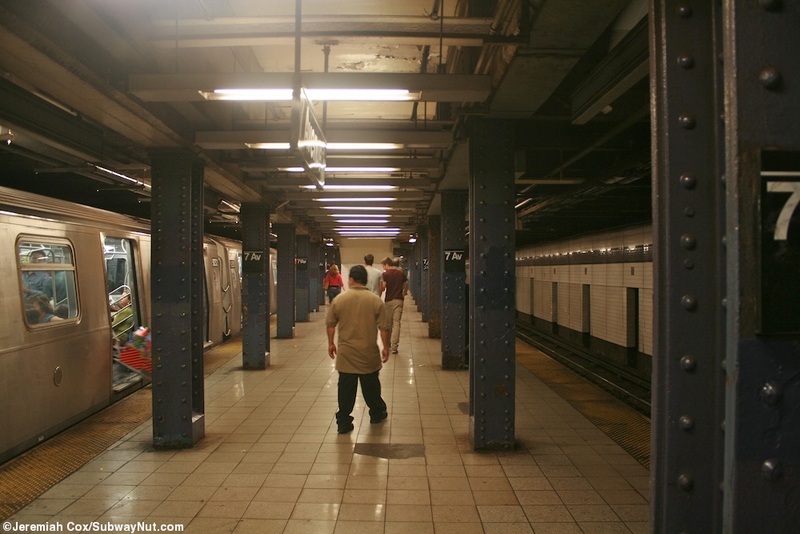 The lower level platform is for uptown trains with E trains arriving from the east (5 Avenue), and B and D trains arriving from the west (59 Street-8 Avenue). 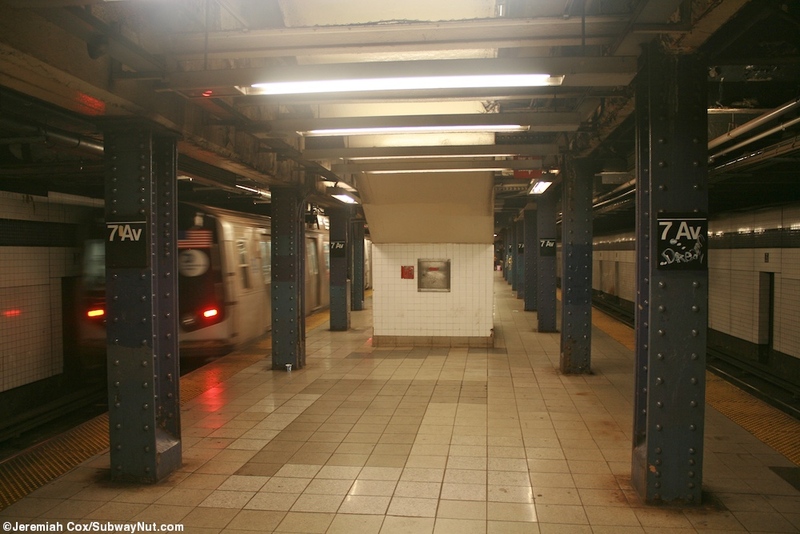 The reverse is true with the upper level for downtown trains (see this table for a visual depiction). 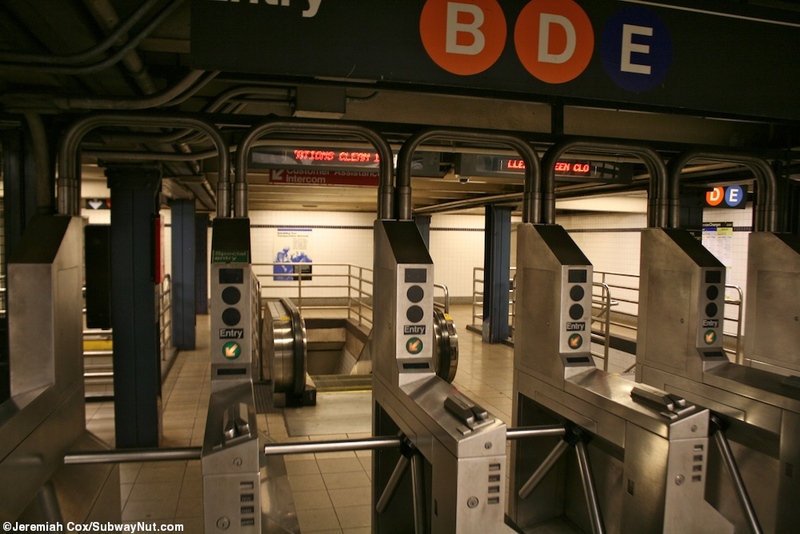 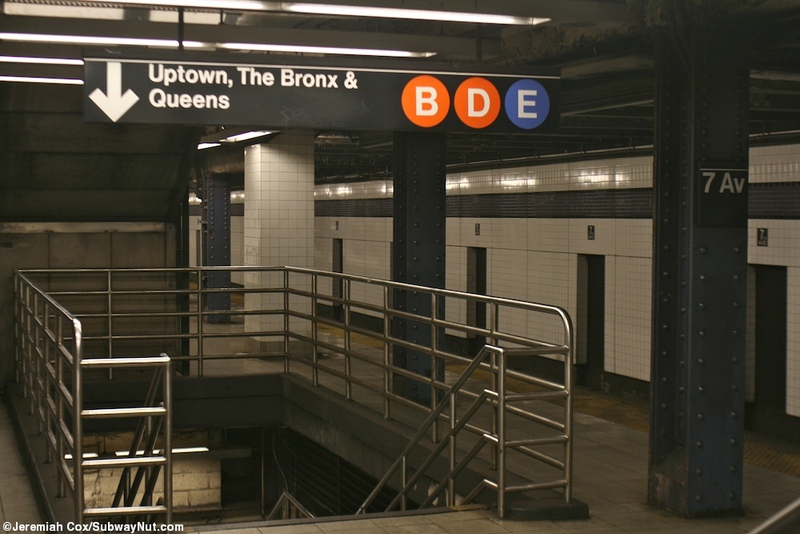 E trains run on the southern tracks, and B and D trains run on the northern tracks. 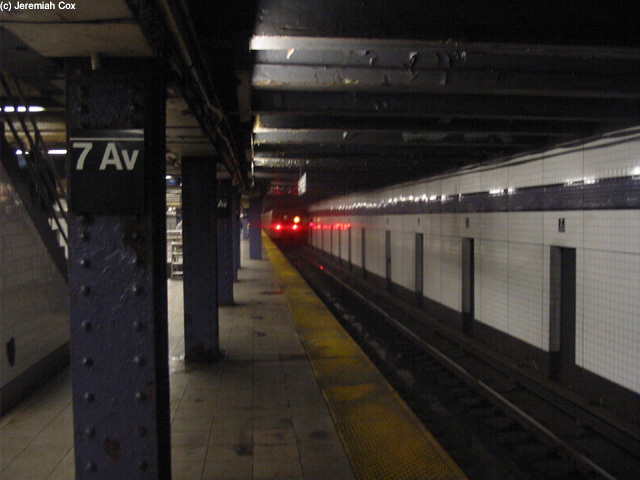 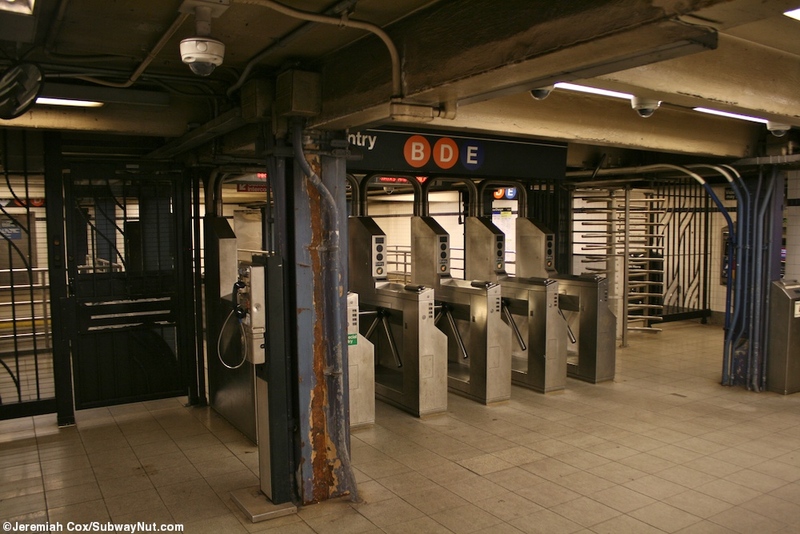 The two station levels are connected by quite a few staircases, and the stop has two separate but basically identical fare control areas, both starting with a street stairs on the NE and SE corners of Broadway or 7 Avenue and 53 Street that lead to small mezzanine areas right beneath 53 Street but not Broadway or 7 Avenue itself since the line is underpinning subways beneath both of those streets. 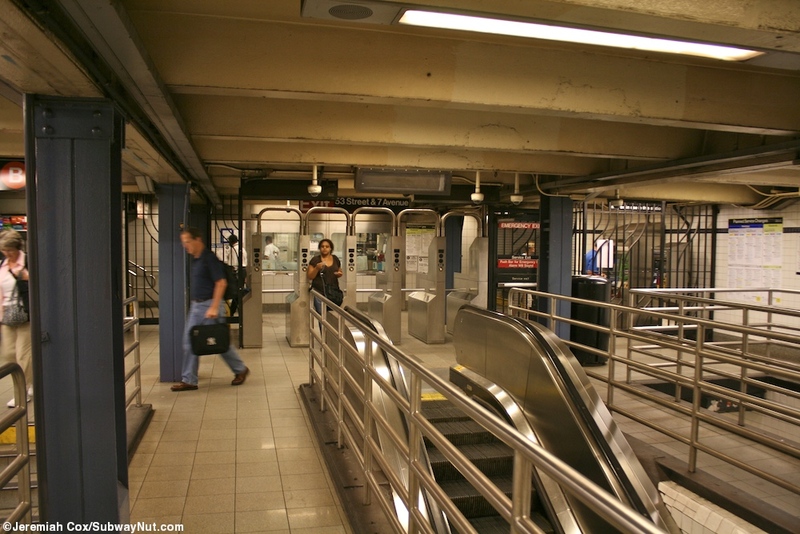 From each of these areas turnstiles (with the 7 Avenue entrance hosting the token booth) lead to two staircases that stop at an intermediate landing before reaching the upper level downtown platform. 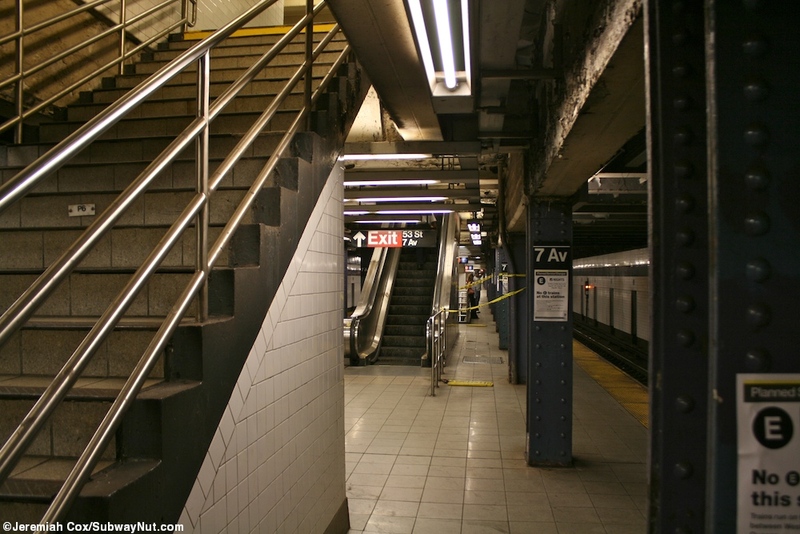 There is also an up-escalator (giving the station two in total) that directly connects these mezzanine areas with the upper level downtown platform. 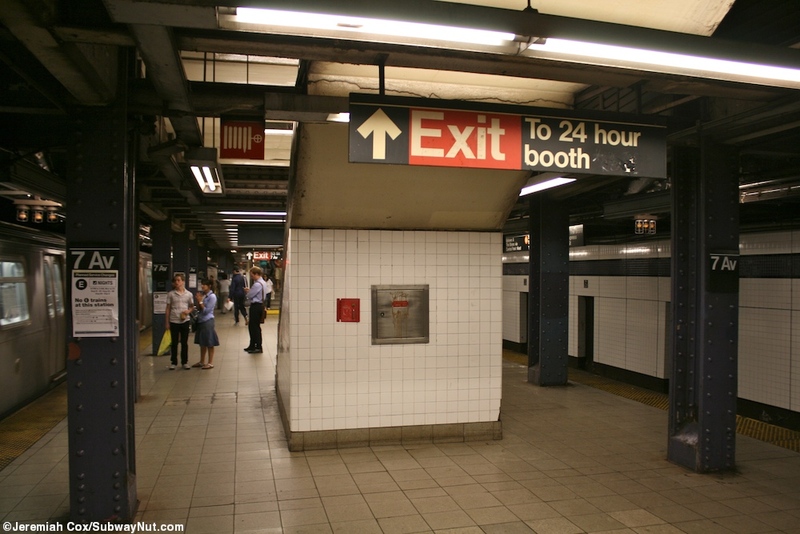 The platform walls were retiled in the 1990s in a scheme in the IND style but with some differences including much smaller little purple mosaic tiles with a black boarder and little 7th Aves written directly on one square (2 x 2) tile beneath the trimline. 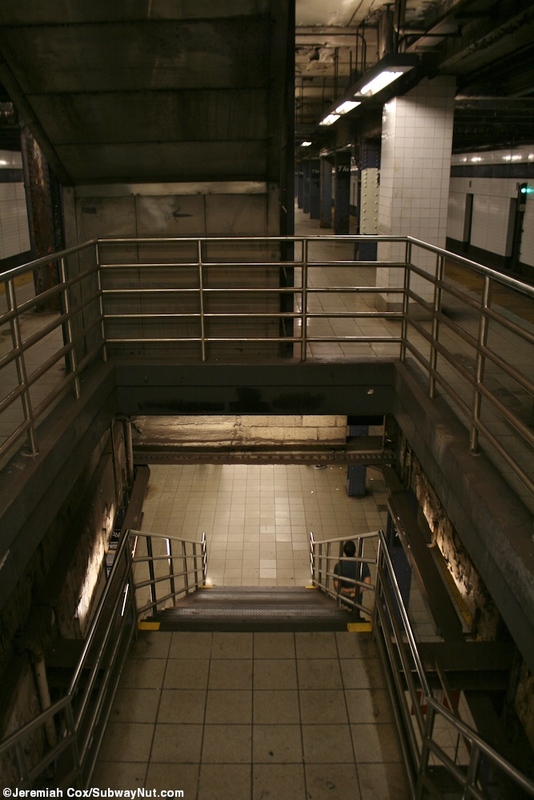 6 August, 2009 (7b7) Up to the exit or down to uptown trains?